How Many Apneas Per Hour Do You Have? In this page you'll learn what is apnea index, and how can you use this index to discover how severe is your sleep apnea syndrome. Do you really have sleep apnea? Some people have similar symptoms with apnea breathing disorder, like narcolepsy, UARS, periodic limb movement disorder or restless legs syndrome. So it's important to discover exactly what sleep disorder you have to receive the best treatment. Is your sleep disorder severe enough to cause a concern? If you have a low apnea or hypopnea index, you might be lucky. The sleep disorder didn't have time to seriously affect your health. However, a higher index may represent hidden side effects that can even affect your life. To understand the definition of apnea or hypopnea index, you need to know what is an apnea event or hypopnea event. Sleep apnea is defined as cessation of nasal or oral airflow for at least 10 seconds. This one episode is called an apnea event or apnea episode. Doctors also use the term hypopnea event, which has a slightly different explanation compared with the apnea event: if your airflow in and out of your lungs is reduced for at least 10 seconds, then you will have a hypopnea event or episode. Notice the difference: the airflow is reduced, not stopped. From the previous definitions, if your breathing stops in you sleep for...let's say...30 seconds, then you have an apnea event (apnea episode). But now we want to know how many of these apnea events you have per hour of sleep. And this number of events is in fact an index which can help the doctor realize how severe is your sleep apnea. Let's suppose you have 15 apnea events per hour of sleep. This means that you have an apnea index of 15.
an apnea index or AI shows the average number of apneas per hour of sleep. an hypopnea index or HI shows the average number of hypopneas per hour of sleep. an apnea and hypopnea index or AHI shows the average number of apneas and hypopnea per hour of sleep. Some doctors use the term of respiratory disturbance index or RDI, instead of AHI. 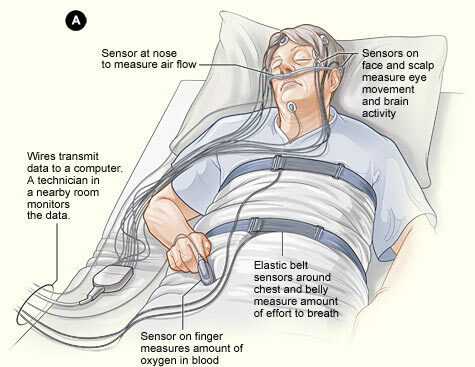 Another measurement used in sleep laboratory is the total number of apnea events during an entire night. An AHI of 120, it means you have 120 apneas and hypopneas in an eight-hour night. Think about it! You wake up at least 120 times a night, without air, gasping and sweaty. And you will not even notice. It's obvious why you are so tired during the day! To wake up at least 120 times a night is a very common number for a patient with sleep apnea. It's not unusual for a person to have at least 200 apneas in an eight-hour night sleep, case of moderate or even severe sleep apnea. Why do you have Excessive Sleepiness? Sleep Study in your own house - Is it possible?